On October 25, 2014 a car traveling westbound on Interstate 90 was damaged when it was struck by an express lane barrier arm that was damaged and blown into traffic. The driver of the vehicle filed a claim with WSDOT requesting compensation for damage to his Honda Accord but the department denied his claim. According to the state "the law in the state of Washington is that for incidents on our state highways, in order for liability to be found, the state must know or should have known of such a condition and either failed to fix or warn of it within a reasonable amount of time. On the date of Mr. Johnson's claimed incident, WSDOT was unaware of any earlier damage to the barrier gate, so the state had no ability to correct the potential hazard prior to Mr. Johnson's incident." On August 3, 2015 attorney Chris Davis accepted KING5 News’ invitation to provide legal commentary on the case. He told reporter Danielle Leigh, "Obviously, they [WSDOT] have a financial incentive to downplay whatever the damage was pre-existing or not. Or if it wasn't, should they have been on notice it was about to happen." 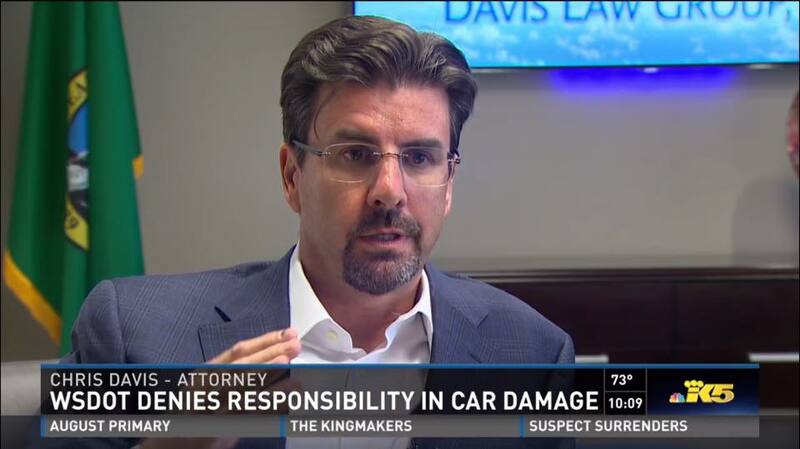 SPECIAL NOTE: On August 3, 2015 attorney Chris Davis accepted KING5 News’ invitation to provide legal commentary on the case involving a man whose car was struck by a Washington Department of Transportation (WSDOT) express lane barrier on I-90. However, it should be noted that neither Mr. Davis nor his law firm represent the accident victim, Don Johnson of Bainbridge Island. Davis Law Group represents individuals who have suffered serious injuries due to accidents caused by the negligence of another person, corporate or governmental entity. Mr. Johnson was not injured in the accident that happened on October 25, 2014. Chris Davis is well known for representing victims of serious accidents including the Skagit River Bridge Collapse; a pedestrian struck by a UPS truck; a bicyclist killed by a corporate vehicle; a couple killed by a Sound Transit bus; and a woman whose face was ripped off by a pit bull attack just to name a few. Because of his experience handling these cases and others Davis is frequently asked by the media to share his knowledge and insight by offering legal analysis and commentary on other newsworthy cases in which he and his firm may not necessarily be directly involved. Leigh, Danielle. "WSDOT Denies Liability in I-90 Barrier Arm Accident." KING5 News. NBC. KING5, Seattle, WA, 3 Aug. 2015. WSDOT Denies Liability in I-90 Barrier Arm Accident. Web. 4 Aug. 2015.